Week 4: Are You Surreal? Time to dig out your dream journal and visualize that wacky wonderland as we take a dip into Surrealism. Taking inspiration from René Magritte’s cheeky skewed representational scenes and Salvador Dali’s wild dreamscapes and creatures, paint and collage your way through this exercise. We suggest painting the background first and then adding your surreal elements from magazines, books, found objects, or other ephemera. Don’t over think this workout- let your subconscious guide you. Yes, we are surreal. Have fun! This week at Wet Paint, stock up on your favorite Mod Podge collage adhesive and sealant- they are all 10% off MSRP! These are water-based, so keep that in mind if glueing over a water-soluble painted background. Categories: Wet Paint Weekly Workouts | Tags: art supplies, collage, Mod Podge, Rene Magritte, Salvador Dali, Surrealism, Wet Paint St. Paul, Wet Paint Weekly Workouts | Permalink. 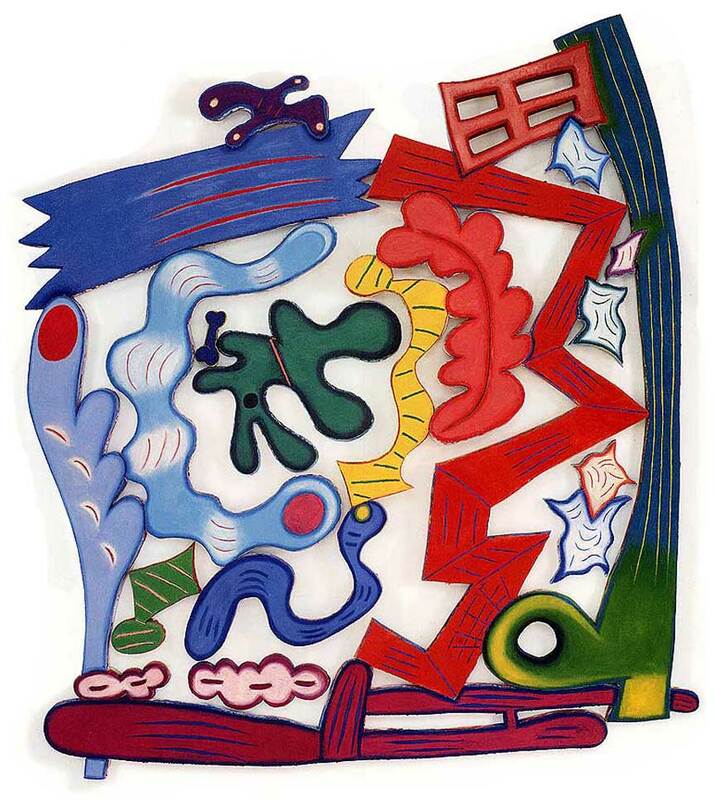 Time to take a walk on the wacky side and cut and paste silly shapes, getting inspiration from the whimsical cut paintings of Elizabeth Murray. For this workout, we will start by cutting 5-7 creative shapes out of colorful paper – if you are not sure how to start, try cutting out your initials. Next, start assembling a freestyle composition with your shapes before gluing them onto the page and feel free to layer and overlap to add dimension. Once the shapes are glued down, add embellishments to your shapes with paint markers- these can be a pattern or texture or just outlining the shape. This week at Wet Paint, all Montana and Molotow paint markers are 15% off our everyday price! Both are refillable, acrylic based paint markers that have opaque ink, so you can experiment with nearly any ink color over the colored paper. Wet Paint also stocks a variety of colored papers (in single sheets or packs) that are great for collaging, and plenty of glues and scissors so you will be ready to get to work! 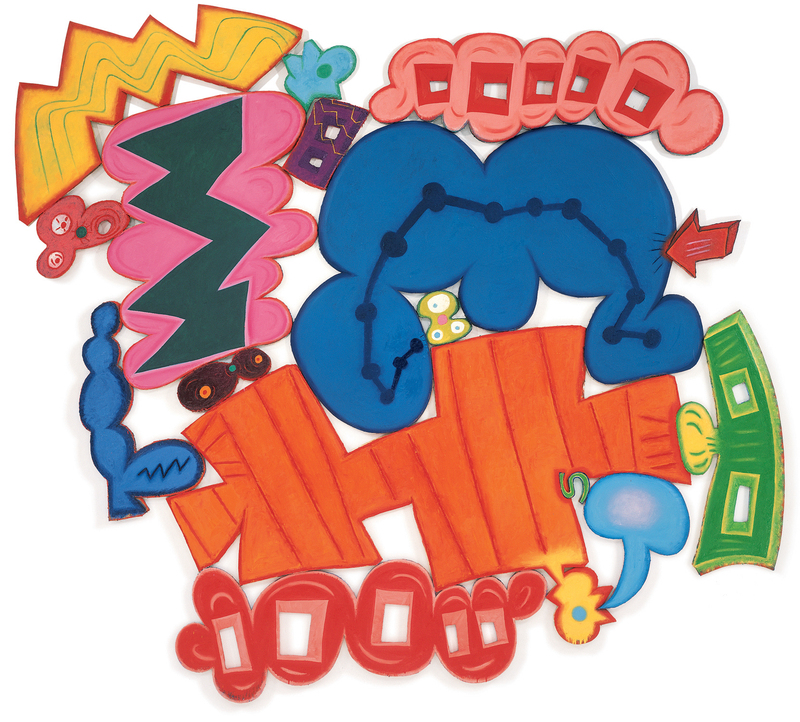 Categories: Wet Paint Weekly Workouts | Tags: collage, Elizabeth Murray, Molotow paint markers, Montana paint markers, Wet Paint, Wet Paint Weekly Workouts, whimsical | Permalink. Many artists are known for collecting- whether it is art supplies, paper scraps or oddities, things tend to accumulate! This week we want to see your stuff in a beautiful layout in your sketchbook like the one pictured by the fabulous Jane Hammond. 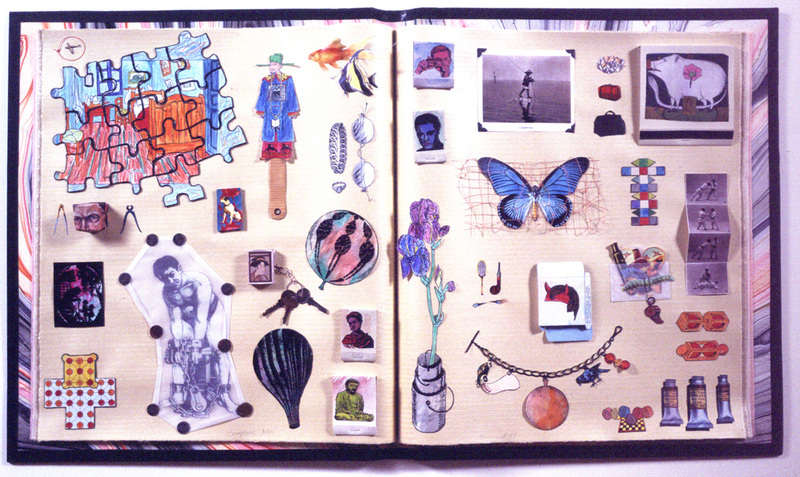 Sketch, photograph, paint, or collage your favorite things, tchotchkes, and memorabilia on the page (or pages). Feel free to tell us a short quip about your collection and your favorite mixed media when you post. Think you don’t have a collection? What about your selection of earrings? Or your keys? Find a stash of something that is like a collection and put it on the page! This week at Wet Paint, all Faber-Castell Polychromos Colored Pencils and Albrecht Durer Watercolor Pencils are 15% off our everyday price (includes sets)! These are two favorite pencil lines of the Wet Paint staff! Categories: Wet Paint Weekly Workouts | Tags: Albrecht Durer Pencils, collage, collection, Faber-Castell, Jane Hammond, Polychromos, Wet Paint, Wet Paint Weekly Workouts | Permalink. Grab your favorite scissors and glue and let’s collage it up! 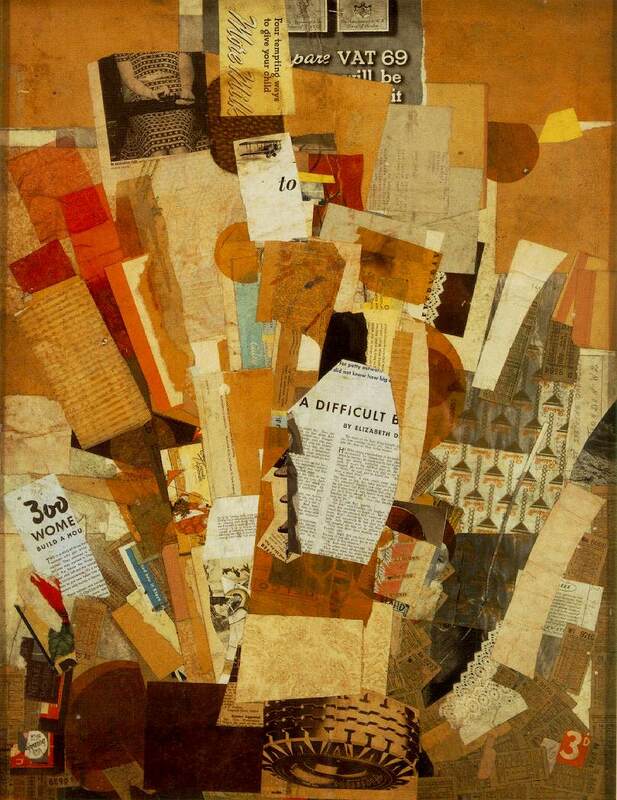 Use the awesome collage by Kurt Schwitters as inspiration to pair your own graphic elements with simple color fields to create visual interest and narrative. Been saving that pretty paper scrap? Or that ticket stub from last week’s outing? Now’s the time to pull it out and start layering ephemera in your workbook (this is a great way to archive your mementos!). Assemble your favorite printed pieces, add additional swatches of color to complement them, and begin “painting” with your paper. 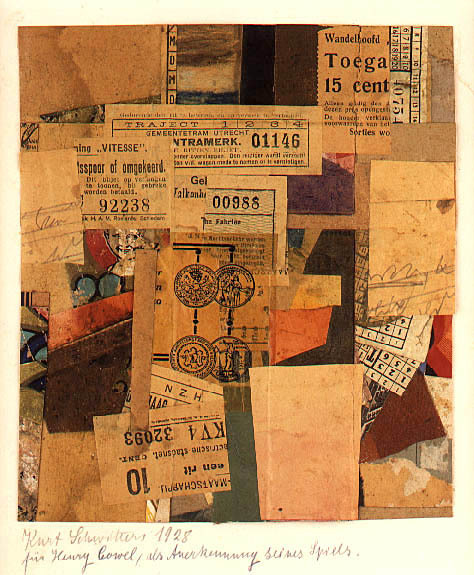 Think of each element like a field of color to unify your image (like Schwitters did with the overall ochre color) and play with layering effects to create unexpected detail. When you’re pleased with your composition and you’ve got the colors and shapes the way you want them, go ahead and commit to it by gluing it down. Don’t collect paper scraps? We have a variety of excellent scrap bags and fun decorative papers to cut up and collage (see below for more info). For glue, we suggest using the super popular UHU stick, or the classic Mod Podge. Acrylic gel mediums work well, too! This week at Wet Paint (4/9 thru 4/15), we have the bountiful & eclectic Mega Mix scrap bags from The Japanese Paper Place on sale for 15% off! Yay! You should also make sure to check out the entire line of super fun, vintage inspired, graphic Italian Cavallini papers for only $4.40 per sheet! Seriously, you almost won’t want to cut these up, they are so cool. Kristina suggests that you buy 2 – one to cut, one to keep! Categories: Wet Paint Weekly Workouts | Tags: art supplies, Cavallini Paper, collage, JPP Mega Mix, Kurt Schwitters, Mod Podge, UHU glue stick, Wet Paint St. Paul | Permalink.